Well, another night of feeling, same old, same old as Leyton Orient drew 1-1 away at Luton Town last night. The O’s fell behind for the 8th time in 10 games as Jack Marriott tapped in at the back post after 33 minutes. Marriott should have doubled the home side’s lead but struck wide. Orient, who rallied against Oxford on Saturday, equalised 3 minutes into the second half through that man again Jay Simpson. The former Arsenal forward struck his 11th goal in 13 games as he tapped in a Sean Clohessy front post cross. Neither side was able to force a winner and had to settle for a point. Luton who suffered their 1st league defeat in 8 games to Crawley on Saturday made 1 change with Paddy McCourt coming into midfield in place of Mark O’Brien, who dropped to the bench. Orient made two changes to their side that drew to Oxford on Saturday, Jack Payne and Ollie Palmer were handed starts after impressing from the bench last timeout, replacing Dean Cox and Blair Turgott who were dropped to the bench. Unusually for the watching eye, both sides were playing a 4-4-2 diamond but in the opening exchanges the sides were cancelling each other out. With space given on both wings, the full backs of either side had the opportunity to venture forward. The O’s finished Saturday’s draw against Oxford strongly but started slow, allowing Luton to have the first chance of the game. Craig Mackail-Smith collected the ball on the right flank, he crossed for his strike partner Jack Marriott. Marriott got in front of his marker but his near post effort was saved by visiting keeper Alex Ciask. 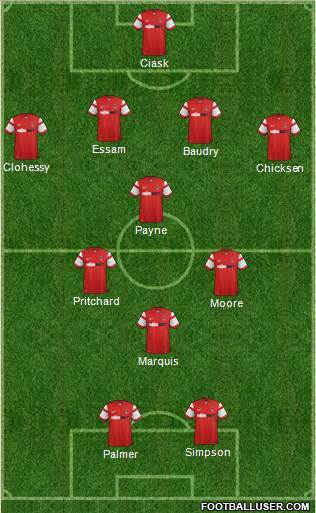 Orient began to grow into the contest with Sean Clohessy and Bradley Pritchard linking well down the right hand side. With Luton’s diamond midfield narrow, Clohessy was continually the outlet ball for the away side but his end product was poor. Orient should have taken the lead on 16 minutes, Ollie Palmer beat the offside trap and reached the byline. His cross from the left found John Marquis but the Millwall loanee’s shot was saved by Mark Tyler. Luton were captained by former Orient center half Scott Cuthbert and it was the former O’s defender who nearly broke the deadlock on the half hour. Paddy McCourt right wing corner was met by Cuthbert but Jack Payne cleared off the line. However just three minutes later the Hatters did take the lead, following a throw in on the right hand side. Orient’s midfield pushed inside, the ball was then switched to Dan Potts who was in space. Potts advanced forward, his crossed was deflected by Pritchard to the back post. With Orient’s defence watching, Jack Marriott nipped in at tapped home to put Luton ahead. The goal gave Luton confidence and really should have doubled their lead. With Orient losing the ball in midfield, Cameron McGeehan broke forward, with an option to his right and left, the former Norwich man shot at goal. His effort hit Connor Essam, falling to the feet of Marriott but the forward snatched his shot wide of the mark. The away side were still finding joy down the right hand side with Clohessy and Pricthard but the ball was not falling in the right areas. But when it did Marquis blazed wide and Simpson clipped wide. But Jay Simpson and Ollie Palmer did combine just before half time with Palmer volleying straight at Tyler. In recent weeks Orient have been a different side in the second period but Luton started quickly with Jonathon Smith blazing over. However, Orient did strike level just 3 minutes after the break, Clohessy was found free on the right, he beat Potts on the inside and approached the edge of the penalty area. His cross found Jay Simpson who beat his man at the near post to flick in and put Orient level. The game completely opened up after the equalizer with space created all over the pitch, the visitors were in the ascdenacy looking to push for a second. Jack Payne saw a volley saved by Tyler before Jay Simpson headed a Sammy Moore cross wide of the far post. Despite much of the ball Orient’s decision making in the final third was poor at times with players failing to pass to the right option. Luton were still in the game and Alex Cisak had to palm away a long range Cameron McGeehan effort away from goal. Orient threw on Dean Cox to try and grab the all important winning goal but it was Luton who had the final attempt on goal. Jack Marriott spun in behind Mathieu Baudry but Marriott could only fire wide of the far post as both sides had to settle for a point. Another game, another point another Jay Simpson goal, a feeling of De Ja Vu eh? Well it is a feeling of the same old story with once again another sloppy goal conceded. Ian Hendon revealed post match to leytonorient.com that he was disappointed in the manner of Luton’s goal. Recent games have seen Orient punished by defensive lapses and last night was no different. To be in and around the play offs teams have to show that they have the ability to keep a clean sheet – Orient are without one since August 29th, a run of 10 games. The defensive lapses have been Orient undoing since August aswell as the failure to be clinical in front of goal. Well apart from Jay Simpson that is who has hit 11 goals in 14 games including five in his last 4 games. Is their an over reliance on the front man, well maybe their is but when a man is in form, he will score goals. Hendon has already commented publicly about other players chipping in with goals – Simpson has netted 11 of Orient 25 goals (44%). Hendon reverted back to the midfield “Diamond” that some people do not like, well I think Saturday’s 1st half performance highlighted that we don’t have the players to play a conventional 4-4-2. Despite not winning games, Orient three defeats have been to sides around mid-table, Yes you should be losing those games, but an important point to make is the games Orient have played with teams around them has not seen points gained by the opposition. It is quite clear that the League 2 promotion race will be a tight affair with only 8 points separating Plymouth who are top and Wycombe who are 10th. Orient sit 6th, 4 points off of third placed Oxford. Another tough trip on Saturday awaits, as Orient travel north to face Morecambe, a side which has hit 11 goals in their last 3 games. Work needs to be done on the training ground with defensive stability but as @Daniel_Slaw wrote on Twitter last night “Could someone wrap Jay Simpson up in bubble wrap for Saturday”. Simpson will be integral to Orient mounting a charge this season but a clean sheet is needed at some point a long the line. Jack Payne impressed once more but with Morecambe free scoring could we see a 4-5-1 formation on Saturday with James brought in to bolster the midfield alongside Payne and Moore or Pricthard. On Saturday we find out, an away trip to Morecambe awaits, the 10:30 from Euston is booked, the anticipation awaits. Only to be shot down as Orient concede in the opening 10 minutes. Well it is never dull being an Orient fan, I am sure everyone could tell you that but come 5 o clock Saturday my emotions could be totally different.